HOW TO INSTAGRAM YOUR WEDDING DAY! Home / Social Media Posts / HOW TO INSTAGRAM YOUR WEDDING DAY! TWO Check your hashtag. Before creating your hashtag, do a search for it on Instagram. If it’s been used by someone else, add something personal to your own hashtag to make it unique. The date of your wedding works well. THREE Make this hashtag known to your friends and family so they know to include it when they upload the photos. 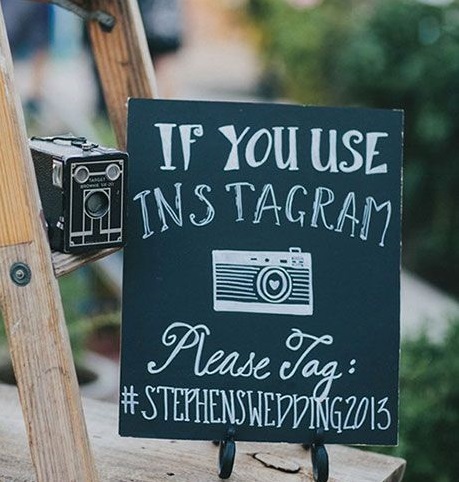 That way, by simply searching for your unique hashtag you’ll be able to see all the photos your guests have posted. You could create some cute signs to dot around your venue on the day – a print out in a beautiful frame works wonderfully. If you’re getting married at The Spinnaker ask your wedding coordinator to do this for you.